From the days of blasting Lion to the present of Revolution Saints. 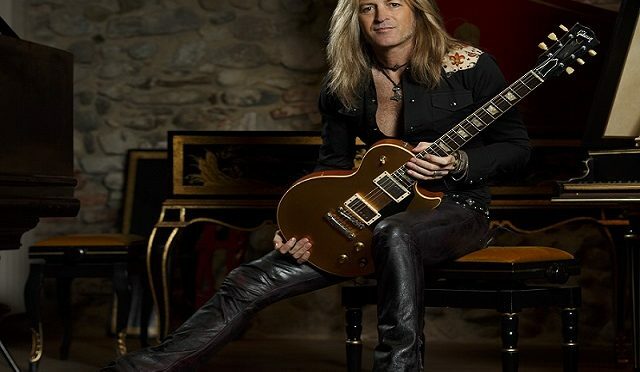 Doug Aldrich has been a mainstay in my life for over 28 years with his monster playing, precise technique and killer tone. I’ve watched Doug’s career progress playing with the legendary Ronnie James Dio, Whitesnake and his other project, Burning Rain. Doug has formed Revolution Saints with two other highly talented musicians Deen Castronova and Jack Blades. I recently spoke to him to discuss there latest album, LIght in the Dark. How were Revolution Saints created? Was it the brainchild of Frontiers? Yes. It was the brainchild of Frontiers, they had heard Deen sing before, and they wanted to feature him singing on a record with songs written by Alessandro Delvecchio and a few others It was leaning in the Journey direction. But then Deen asked me to play on it. He asked Jack Blades to play on it. When the record company heard it, we both agreed let’s make this a band. And then the producer said OK I want you to change your guitars and you know make them as you did in Whitesnake. I said I’ll do my best to do that and that we ended up with Revolution Saints first record. Deen sounds great! I call him the second coming of Steve Perry. DA: You can hear in Deen’s voice that he’s happy and doing great. Did you know Deen can play the guitar too? DA: It was pretty funny, he sent me a tape of him jamming. He said listen maybe there are some ideas in here. Something you could use for the record. He was going to be involved in writing regarding arranging and lyrics, melodies and stuff, but I didn’t expect him to pick up a guitar. But he sent me a tape of him jamming for like 30 minutes, and I found a couple of things in there that we used for the record and one of the main ones was the inspiration for the song Freedom. I have a problem with these supergroups being formed and they never tour. They’ll release a record and no tour plans. Is RS going to have touring plans? DA: That’s the problem with Revolution Saints is that initially when we did the first record we got some great offers to tour, and we just couldn’t get it together. My show is Vegas was just getting going, and it was getting more popular. The producer would give me a hard time. He said, Of course, you can go back to Whitesnake, but he didn’t want me taking off doing other things. We weren’t able to tour because of our schedules. Journey was always touring. We’re going to do this. We need to commit to each other that we’re going to try to do a tour here and there. Even if its a couple of weeks here and there. The fans deserve it. I know we could do a great show. We did break our cherry we went to did that Frontiers Fest and it wasn’t the best performance of the day. I would say, but it was good. And through the first show between the three of us, I was only having a couple of rehearsals ahead of us. So I know we could be a great live feature if we take the time. So that’s what we’re looking at right now. Hopefully, we’ll get some good offers. How long did it take to record the second album? DA: We started banging around ideas for it in January, February because we wanted to write ourselves on it this time. I wasn’t sure how that was going to go because we did one time getting the room together and we were all in Las Vegas one day, and we decided hey let’s have a jam meal. So we went to a rehearsal place, and we just jammed. We didn’t play any of the songs on the record. We just went off, and we’re jamming like Hendrix riffs and all that stuff. I didn’t know what we were going to come up with, but we started to pass on some ideas, and it’s a little different, but it’s still got the same flavor. It took about three weeks to record. We were arranging the ideas that we had we all showed up to Italy together, and we spent I spent two and half weeks and I think Deen was there for three and a half weeks and he did vocals after I left and I did guitar solos on the road because when I was out with the Daisies. How did the writing process take place? DA: I think the beginning it’s just Alessandro and me and knowing that Deen was going to get in on the songs and arranging the lyrics and melodies. Jack contributed his regular excellent ideas as Jack’s also a producer just like Allesandro is. You’ve been playing Gibson Les Pauls for a while. Are you endorsed by them? Anyone for guitars currently does not endorse me. I like to play what I want. Back in 2014, Gibson USA contacted me about doing a signature series, and I was like well everyone already owns a gold top. I had bought on eBay a 57 reissue blacktop that was woodgrain and had a black finish. I said to Gibson USA, why don’t we do guitar called The Black Hornet. It had Amber Wood and Amber knobs. It was mostly black. I said why don’t we do this and they said Great. So they did a prototype, and we had a couple of little tricks in there, and the neck was getting right, and the frets were getting right, and I wanted to do one more prototype, and they had it built, and I saw a picture of it. And then all of a sudden the Artist Rep guy and the builder were let go from Gibson My project went away, and I never knew what happened to the guitar. I reached out to Gibson and asked where it was. They said they destroy stuff like that. I started thinking; there’s no way a guitar that’s finished is going to be destroyed. So right now I’m not endorsed by Gibson. They’re going through many changes now. I have been working with ESP, and they asked me if I need anything for a tour, and I had stopped by the factory, and I like this Ron Wood signature model that they put out. It’s a killer kind of a tuxedo Telecaster. With a humbucker in the neck. And I love that, and they said listen, what can we do to get you to play one of our guitars. I said let’s stick another humbucker in a Telecaster. So they made it custom to my specs as far as the neck and the frets and the pickups. It’s screaming. I just got it. It’s a distressed gold Telecaster with a black pickguard which I like, and it’s it sounds fantastic. The Daisies are on hiatus right now. Hopefully touring in support of the new Revolution Saints album. I’m in another band with Keith St. John called Burning Rain. We’re going to get together and record an album and do a tour. Be sure to check out Revolution Saints new album, Light in the Dark, out on October 13th, 2017 via Frontiers Records.